Support WriteGirl. Buy Our Anthologies! 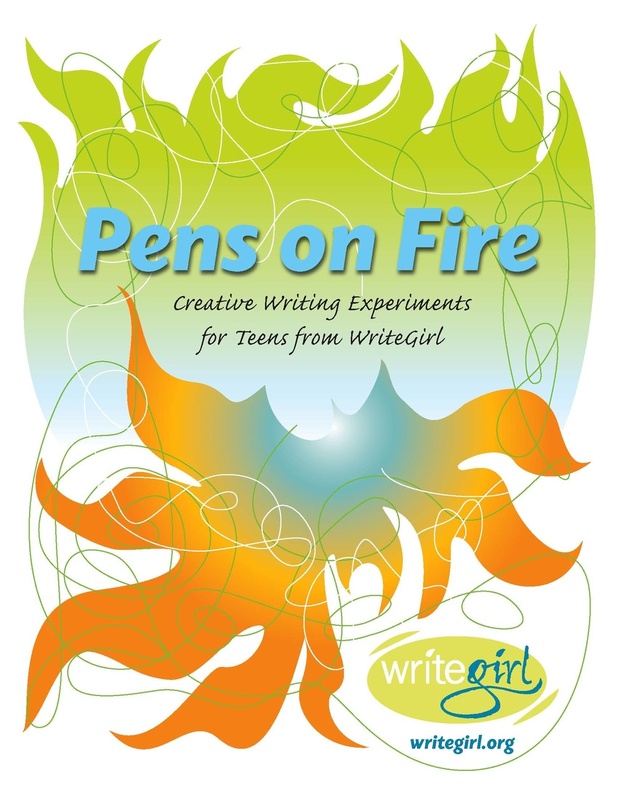 WriteGirl Publications offers award-winning anthologies that showcase the bold voices and imaginative insights of teen girls and their WriteGirl mentors. The books present a diverse collection of personal stories, poetry, essays, scenes and lyrics, as well as innovative writing experiments for writers of all levels. WriteGirl books have won 81 national and international book awards! Click to view the list! In Sound Generation, the teen girls of WriteGirl share poems, stories and songs about their identity and dreams, relationships and challenges, midnight phone calls with friends and international adventures – both real and imagined – across Los Angeles, the United States, South America, Europe and more. Many pieces in this anthology are inspired by music – how melodies and lyrics connect girls to their lives, and connect them to the world. From the soundtrack of a grandmother’s kitchen, to a cassette playing when a girl first realizes she is in love, to vinyl records shrouded in well-worn sleeves, the sounds of these writers’ words transport readers to places where we can rejoice, reflect and resist together. Tune into the soundscape of your own life as you listen to the voices in this book...and enjoy an entire symphony of writing advice and experiments to help you compose your own stories. “Fearless, raw, and melodic – these poems and stories stand up and belt out: ‘I am here.’ The writing on these pages is not remarkable ‘for a teen.’ It's remarkable – full stop. Each voice in Sound Generation hums with verve and veracity." In Emotional Map of Los Angeles, the girls and women of WriteGirl share poems and stories about their lives, their families, their dreams and their emotions. Many of the pieces in this anthology connect with Los Angeles, where concrete rivers, vines of jasmine and miles of freeways weave a complex web of canyons, landmarks and neighborhoods we all call home. The city where we live is filled with people, life lessons, heartache and joy that carve their way into the landscape of our lives. Think about your own adventures as you turn the pages, because an emotional map isn’t something you follow, it’s something you create along the way. In this, our 14th anthology, 190 women and girls contribute their creative voices! "It is a gift to explore Los Angeles through the eyes of these brave and talented young women. I'm awed and inspired by the way this collection captures the heart, nerves, and soul of our city. We have so much to look forward to from the next generation of LA writers. This book is a remarkable and unforgettable trip. Prepare to be stirred." Buy a pack of inspirational postcards with writing inspiration from WriteGirl teens and photos by WriteGirl Communications Manager Katie Geyer. If life were a straight line, it would be easy to stay on course. But life is full of twists and turns and unexpected bumps. In YOU ARE HERE: The WriteGirl Journey, 161 women and girls share their stories as they navigate their way through small moments and big adventures. In clear and unwavering voices, they tell us about where they are, where they’ve been and where they still hope to go. So climb in, adjust your rear view mirror, toss your GPS out the window and let this book be a passport to your own unexpected journey. “The writing these girls produce is sharp and visceral, yet full of grace and insight. Creative Writing Guide for Teachers & Youth Leaders. Over 200 Creative Writing Experiments. Great for teachers, schools and groups. Between texting and tweeting, it may seem that “real” writing has gone out the window. But it hasn’t, and the girls and women of WriteGirl prove it. No Character Limit features the creative work and candid voices of over 125 writers in one emotionally charged volume. Enjoy their quirky humor; experience the universal pain and exhilaration of young love; and dive into the changing lives of these bold women and girls. INTENSITY presents creative work by more than 140 writers, including stories, poetry, lyrics, and novel excerpts. Get inspired by their candid writing advice throughout the book, and work your way to the closing chapter full of writing experiments. 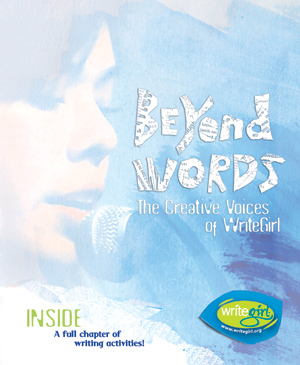 Beyond Words is the ninth anthology from WriteGirl. More than 150 teen girls and professional women writers share their diverse perspectives and stories about family, identity, friendship, love, music, loss and more in this unique collection. From poignant poetry to breakup lyrics to an essay on finding meaning within a shag carpet, Beyond Words unveils a broad range of confident and fresh voices. The book concludes with a full chapter of innovative writing activities and advice for aspiring writers at any level. “Beyond Words is an anthology alive with discovery, humor, and a keen examination of the world through the written word." Winner of Seven Book Awards! Silhouette, the eighth anthology from WriteGirl, captures the perspectives of women and girls writing about love, fear, relationships, school, accordions, foreign countries, Los Angeles, pastrami and the world around us. Writing advice and experiments will help you develop and share your own bold voice. WriteGirl mentee at a Public Reading at Skylight Books in Los Angeles. Listen to Me: Shared Secrets from WriteGirl! Love, pain, relationships, cravings, neighbors, murder, boredom, mysteries, vegetarians and peacocks are just a few of the subjects inside the pages of Listen to Me: Shared Secrets from WriteGirl. An entire chapter offers a variety of writing experiments to help you discover and share your own secrets. Listen to Me is a dazzling chorus of smart, tough, inspired voices of independent-minded young women. Listen to Me is blood on paper. Souls on the page. What courage these young writers have, what generosity. The short prose and verse selections are by turns raw, crackling with energy, naïve, knowing, and, above all, deeply personal, revealing the inner lives of strong but vulnerable females. WriteGirl’s wonderful, inspirational anthology belongs in every media center, public library, and creative writing class. Winner of 6 Book Awards! The 6th Anthology from WriteGirl Publications, LINES OF VELOCITY is a wondrous and diverse collection -- stories, poems, songs, musings, rants and essays -- showcasing the unique and eclectic female voices of new and accomplished writers from WriteGirl. These girls and women speak freely about everything from the intensity of a teenager's bad day to the exhilaration of finding love in urban Los Angeles. Includes writing experiments from monthly workshops of the WriteGirl season. "LINES OF VELOCITY is full of magic. Not just the wonder of raw, vivid writing, but also the alchemy of writers, leaping across age and cultural divides to inspire each other. The resulting work crackles with energy." “[Lines of Velocity] is a dynamic exchange of shared prompts, ideas, and projects as well as an obvious display of the inspired, caring, multigenerational relationships that were formed in the process." WriteGirl's anthology, UNTANGLED: Stories & Poetry from the Women and Girls of WriteGirl, is the award winner for Fiction & Literature: Anthologies in the Best Books 2006 Book Awards. 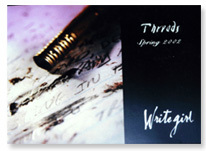 UNTANGLED is the 5th anthology from WriteGirl Publications. UNTANGLED offers a fresh look into the minds of women and girls with 288 pages of honest poetry, shocking fiction and emotional nonfiction as well as inventive tips and a chapter of writing "experiments" from all the writers. Stephanie Almendarez, 18, muses over her coming-of-age struggles and revelations. Seventeen-year-old Shauna Herron explores the role of women in society, while Melissa Castillo conveys wisdom beyond her 15 years with vivid descriptions of her daily life, including her grandmother's intoxicating kitchen. In UNTANGLED, girls take a magnifying glass up to themselves and their worlds. This book breaks the rules of what writing has to be - there is a sense of abandonment in the variety of styles and subjects covered. It's like going on an adventure since every page takes you somewhere else. A literary adventure like no other. It’s the fourth anthology published by WriteGirl, a creative writing and mentoring program matching teen girls with mentors from the ranks of Los Angeles' most respected professional women writers. Dramatic in range and full of startling perspectives, these writers truly hold nothing back in this compelling collection of poems, lyrical essays, bold fiction and more. 100% of proceeds from sales benefit WriteGirl’s creative writing and mentoring program for high school girls. - Read David Ulin's full review from the Los Angeles Sunday Times Book Review. WriteGirl’s 2004-05 anthology, showcases the poetry, essays, stories, scenes and lyrics of more than 100 teenage girls and women writing on love, family, identity, community and society. A compilation of writing from girls and women ages 11 through 55. This unique collection of poems, short stories, essays, songs and scenes addresses everything from love and war to culture and current events. As a result of such diverse voices, Bold Ink provides the reader with insight into the minds of today’s young women, while celebrating the art of creative writing like no other anthology. WriteGirl’s premiere anthology captures the voices of Los Angeles women and girls in this powerful collection of poems, short stories and essays.